Note: Three compartments, two watertight bulkheads, hopper side tanks, steam windlass. Bessemer Steamship Company, Cleveland, OH. 1896, Oct 5 Enrolled Duluth, MN; 3 masts. 1901 Owned Pittsburgh Steamship Co, Cleveland, OH. 1924 Rebuilt, 3010 gross / 2807 net tons. 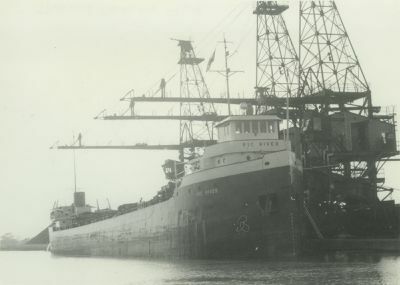 1936 Owned Marine Iron & Shipbuilding Co, John P Geistman, Duluth; renamed MERLE H.
1937 Owned Pigeon River Timber Co, Port Arthur, ONT, C158268. 1938 Owned Lakehead Transportation Co, Ltd.
1942 Owned Great Lakes Lumber & Shipping Co, Ltd, Fort William, ONT. 373 x 44.6 x 22.1', 3569 gross / 2479 net tons; capacity 2100 pulp cords. 1960 Owned Quebec & Ontario Transportation Service, Montreal; 4 cycle, 6 cylinder Birmeister & Wain diesel, 1650 bhp., 21 5/8 x 35 7/16. 1978, Dec 1 Laid up, Hamilton, ONT. 1949 Renamed PIC RIVER; owned Quebec & Ontario Transportation Co, Montreal.